Once harvested from the plant, flowers undergo physiological changes that lead to rapid deterioration. Factors such as the flower stage and time of day at harvesting, bunching, sleeving, shipping, temperature treatment, and the holding solution all influence the quality and longevity of the flowers. Here are tips that consumers can use to increase the life of cut flowers. Wash the container being used for the cut flowers prior to each use to remove dirt and bacteria. Bacteria multiply and clog the water-conducting vessels of the flowers and cause flowers to wilt. Cut about an inch off of the flower stems under water using sharp shears or a knife. A fresh cut absorbs water freely. Cut either on a slant or straight across. Slant cuts can keep stems from lying flat on the container bottom and increase water uptake. Remove any foliage that will be below water. Foliage that is submerged will decay and reduce the life of cut flowers. Place stems in clean warm water, 100F (about bath temperature). Let the water cool naturally. Warm water has less dissolved gas bubbles in it and moves easier and faster in the cut stem than cold water. Air bubbles can block water uptake. The base of the stem should be covered with water however, deep water is not necessary. Although deep water can reduce transpiration, most of the water is taken up through the base of the stem. Using a commercial flower preservative in the water. Flower preservative contains sugar to encourage bud opening and flower longevity; an acidifier to lower the pH, increasing water movement; and a biocide to prevent bacterial growth which can clog stems. Many, but not all cut flowers benefit from a preservative containing 1 to 2% of sugars and a dilute biocide. Some cut flowers are held best with no preservative. For all flowers, it is at least necessary to use clean containers and clean water. There are simple recipes to make your own flower preservatives, if a commercial product is not available. The first formula calls for mixing a can of a non-diet citrus soda with 3 cans of water and 1.2 ml of household bleach (contents of 1 to 1 ½ droppers). The second formula calls for 2 tablespoons of fresh lime or lemon juice, 1 tablespoon of sugar, 1/2 tablespoon of bleach and 1 quart of water. Mix the ingredients for either, and the solution is ready for the cut flowers. These solutions contain the major active ingredients necessary for a good preservative solution, i.e. sugar, citric acid, and a biocide. Because these solutions contain bleach, they need to be replaced every day, or at least every other day, to prevent the growth of microorganisms. Finally, avoid placing flowers near a draught or heat source. Warm air and air movement causes flowers to lose water faster than they can absorb it. Heat also causes flowers to quickly mature. Increase the life of your cut flowers by placing them in a cool room (as low as 33F) when not in use. Most orchids and other tropical flowers should not be placed at temperatures below 50F. Some cut flowers such as roses and chrysanthemums have difficulty recovering when wilted. When flowers wilt, it may be that the water conducting vessels in the stem are blocked due to air bubbles or bacterial growth. 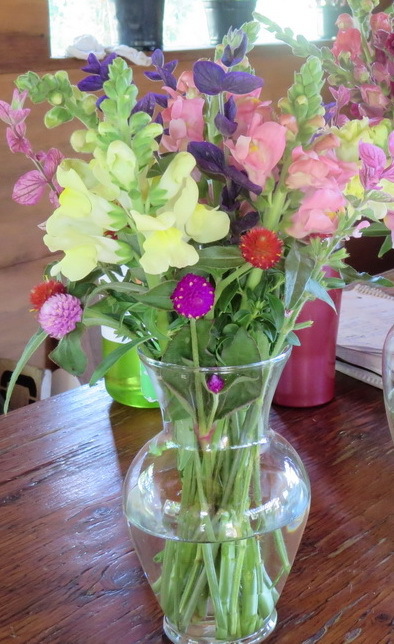 To help flowers re-cover, re-cut stems under water (clean water, clean container). Cutting under water, allows the water to quickly fill many of the water conducting vessels. Even better, after stems are cut, allow the stems to lie in the water for an hour or more to reduce water loss through the leaves. Wilted flowers often recover within an hour or two. Gast K.L.B. 1997. Post Harvest Handling of Fresh Cut Flowers and Plant Material. Kansas State University. Han S. Sugar and Acidity in Preservative Solutions for Field Grown Cut Flowers. University of Massachusetts. Harvesting and Handling Cut Flowers. 2016. UMass Extension. Reid M.S. and L.L. Dodge. 1997. Flower Handling: Sanitation is Crucial. Perishables Handling Quarterly Issue No. 92. Reid M.S. Post Harvest Care of Cut Roses. Growing Points. Dept. of Environmental Horticulture. Univ. of Calif. Davis. Vol.2(4) Fall 1998.